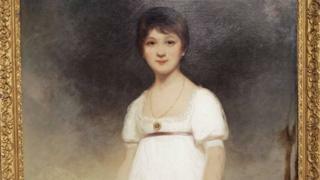 A Cambridge college is giving the public a "rare chance" to see the manuscript of Jane Austen's last unfinished novel. The unfinished novel, called Sanditon, was given to King's College in the 1930s by the author's great-niece. The college library has organised an exhibition of Jane Austen documents from its archive to mark the 200th anniversary of her death. It includes a "rare survival" - a complete letter from the author. The library is taking part in Heritage Open Days - an annual event when historic buildings not usually accessible to the public open their doors. Austen's great-niece Mary Isabella Lefroy gave King's the manuscript of Sanditon because her sister was married to the college's 32nd provost Augustus Austen Leigh, who was also a great-nephew of the author. She was concerned that the manuscript could be sold by relatives after her death, according to college archivist Patricia McGuire. College librarian James Clements said Austen began the novel in January 1817 in three separate booklets, the last of which was dated 18 March 1817, just a few months before she died. "It's one of the few Austen manuscripts around and [the exhibition] is a rare chance to see that," he added. The college also holds one of the few surviving complete letters by Austen - a letter to her publisher James Murray. Dr McGuire described it as "a rare survival" because the author's family "were inclined to cut her letters into pieces and sell the pieces to make more money out of them".